I recently invented a special machine that allows me to travel between parallel universes and watch NASCAR races in two different dimensions. I just arrived back from the alternate universe where Joey Logano elected to race cleanly and NOT move Martin Truex Jr. for the win at Martinsville. If you’re wondering how that decision went over with everyone, I brought the postrace transcript from Logano’s runner-up press conference from the parallel universe. Here it is. Is it possible to agree with Logano’s last-lap move and still empathize with the obvious anger felt by Truex and Cole Pearn? Truex had an incredible drive on Sunday. He had his qualifying time thrown out and started in the back, only to make it through the field — at Martinsville, no less! — and contend in the top five almost the entire day. Truex fought his way toward the front, then patiently and cleanly worked Logano for the lead until making what seemed to be the winning pass. Had Truex won, that would have been one of the highlights of his career: First short track win, a win-and-in ticket to Homestead, high stakes with his team getting ready to shut down and people loudly saying he’s the most vulnerable of the Big Three drivers to miss the final four. Instead…Logano ran into him. And now making Homestead is no sure thing. Frustrating! Super, super frustrating! Who wouldn’t be angry about that? I still don’t blame Logano for making the move, but it’s completely understandable why Truex and his fans would be upset about it. When looking back in a couple weeks, that one moment could very well be the difference between competing for a championship and missing out altogether. That said, as mad as he may be now, I see no scenario under which Truex retaliates. He’s just not that kind of driver. Even if he doesn’t make Homestead, Truex isn’t going to go out and ruin Logano’s championship race with a crash. He might race Logano hard, but Truex won’t pull a Matt Kenseth. No way. I’m not a driver, so this is just one interpretation of what’s OK on the last lap in NASCAR and what isn’t. — If you can move someone out of the way and do it without ruining their day — i.e. without wrecking them or costing them more than a few positions — then it’s not only acceptable in NASCAR, but expected. And even encouraged by series officials. — If you have a chance to door someone for a side-by-side finish, it’s a coin toss as to whether the other driver and the general fan base will think it’s an acceptable move. This often depends on the person initiating the contact. — If you accidentally wreck the person while trying to move them (like Denny Hamlin on Chase Elliott), that is considered off-limits and there will be repercussions from both the other driver and fans. — If you crash the person in a reckless-but-unintentional way (not necessarily on purpose, but understanding there will be full contact like Noah Gragson on Todd Gilliland), people may view it the same way as a blatant takeout. — If you completely crash someone on purpose in order to win, that’s viewed as a dirty move that takes no talent and the fallout might stain your reputation for years. Logano’s move on Truex — like any bump-and-run at a short track — is about the least offensive way to physically move someone and falls into the first category. That’s the type of move that can only happen in stock car racing and is a hallmark of what makes NASCAR fun. You’re not going to get that in Formula One, let’s put it that way. Over the last four weeks, I’ve taken a step back from NASCAR as I got off the road for the birth of my daughter. Though I’ve tried to follow the news as much as possible, there’s no doubt having a newborn at home makes it difficult to be as immersed in the NASCAR bubble as the weeks when I’m on the road at races. And I’ve got to tell you: Looking at the big picture, it’s a bit alarming how the NASCAR world seems to get caught up in minor, tiny crap that doesn’t really matter and actually detracts from the sport. One example is the race day morning inspection where qualifying times get thrown out. Here I am as a TV viewer who woke up excited to spend my Sunday watching some short-track racin’ across the country. I opened my Twitter app, and what was the big storyline of the day? Drivers getting their qualifying times disallowed, starting at the back for unapproved adjustments, crew members getting ejected, etc. Seriously? This is what we’re talking about on playoff race day morning?? For a short track where aero doesn’t even really matter??? Officiating things that way certainly seems excessive. And yes, I know all about the reasons why they do it; I’m explaining the big-picture view of why it seems silly. Another example was the race a couple weeks ago at Talladega. My wife was in the hospital that day and I was unable to pay much attention to the race, though we had it on in the background on mute. When I tried catching up with what happened, the big controversy was apparently about whether NASCAR should have made the caution one lap shorter and whether officials should have thrown a yellow for a wreck on the last lap instead of having it finish under green. Look, I completely understand why those are significant debates for those in the NASCAR industry and fans who are super passionate about the sport. But can you imagine how all this looks to casual fans or people who might want to give NASCAR a chance? Headlines like Drivers criticize NASCAR for running them out of fuel with long caution! and Fans angry NASCAR chose drama over safety on last lap! just seem like such minor things from afar. As does Defending champion will start at the back today for failing laser scan on first try! I’m not suggesting I have the solution to all this, because I don’t. And I’m not criticizing the media, certainly; when I get back at Texas next week, I’ll be all-in with the bubble once again. But if these are the storylines, NASCAR has some real work to do. It cannot afford to be stuck on the minutiae, because there aren’t enough people left who care that much. Simplify things, focus on what really makes people want to spend their time on the sport (great racing and interesting driver storylines) and everyone will be much better off. Logano taking a guaranteed spot at Homestead means at least one of the Big Three is going to have to point their way into the final four. After Martinsville, Truex and Kevin Harvick are tied for the last two spots, 25 points above the cutline. I think both will be OK, as will Kyle Busch. Harvick is probably going to win Texas, Phoenix or both; Busch might win one of those as well. That means Truex, with a pair of top-five finishes, should be just fine. Aric Almirola, Chase Elliott, Clint Bowyer and Kurt Busch are already facing big points deficits after just one week. Are any of them going to win a race in this round? I actually think it’s more likely a non-playoff type like a Denny Hamlin or a Brad Keselowski will win, which would open up an addition points position for a Big Three member. So as it turns out, perhaps all of the Big Three will make it to Homestead after all — just maybe not exactly how we expected. If you’re mad at NASCAR officials for 13 cars failing to make a lap in qualifying Friday at Auto Club Speedway, you’re angry at the wrong people. Getting upset is understandable; everyone wants to see all cars on the track. But blame the race teams, not those trying to keep them within the rules. 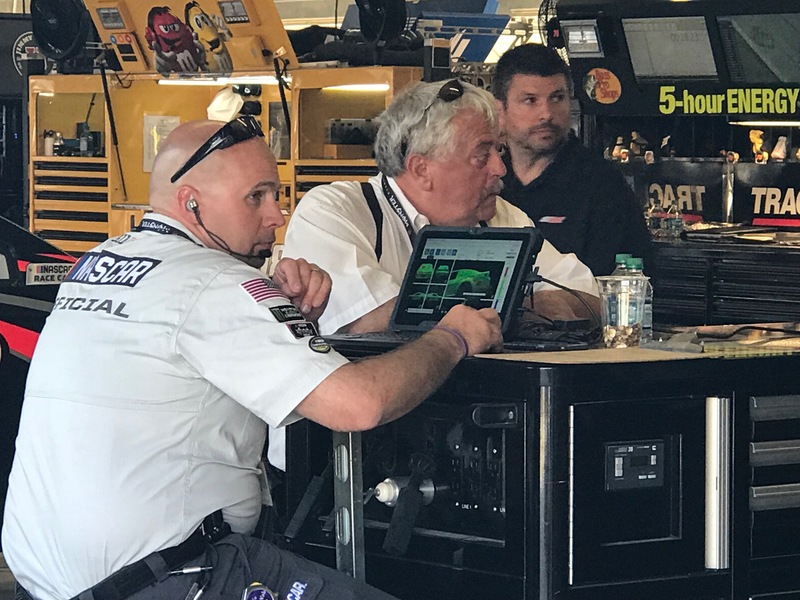 NASCAR has vastly improved its technology this year with the new Optical Scanning Station, an inspection system which drivers and crew chiefs alike agree has been much more consistent and reliable than anything NASCAR had in the past. If a team fails inspection now, there’s little mystery why it happened: Because that team was trying to push the limits as much as possible and went over the line. NASCAR gives three hours for teams to get through pre-qualifying inspection. Three hours! But when only 12 of the 37 cars pass on the first try, which was the case on Friday, not everyone is going to have time to make it through three times. All the teams who didn’t get to make a lap? They all had enough time to make at least two passes through inspection. And they failed. How is that NASCAR’s fault? The answer: It’s not. Most of the teams now have Optical Scanning Stations in their race shops! They know exactly what can pass and what doesn’t. NASCAR senior vice president of competition Scott Miller said teams were failing the body scan for a variety of reasons on Friday, but he saw many not passing because of the rear window area. Hmm. Have you heard anything about that area recently? Ah, right. Look, Auto Club Speedway is the most aero-dependent track NASCAR has visited so far. So it’s no wonder teams are trying to squeeze all they can out of the rules. Miller said the number of cars that passed on the first inspection attempt last week was in the mid-20s and had been climbing higher in the last couple races. Clearly, the teams know how to pass the body scan if when they want to. But they showed up at Fontana trying to get some more speed, and it made a mockery out of qualifying. Here are some highlights from Kevin Harvick’s media availability on Friday morning at Phoenix, where he addressed the penalty issued to his team this week. “The car passed all the Optical Scanning Station inspections and everything after the race. The car was built to tolerance. The scary part for me is the fact that (NASCAR) went far enough to find something on the car at the NASCAR R&D Center. They could find something wrong with every car if they took it apart for a whole day at the R&D Center. The new Optical Scanning Station inspection system was a mystery heading into the first real qualifying day of 2018. Would a bunch of teams fail at in the first downforce race of the season at Atlanta Motor Speedway, as they did under the old system? Or would everyone sail through now that it is tougher to push the rules? Perhaps it would be somewhere in between. For the most part, that was the case. More than half the field (20 of 36 cars) breezed through on the first attempt, and only three cars had to make more than two attempts. But while Jimmie Johnson and Harrison Rhodes made it through on their third tries, defending Cup champion Martin Truex Jr. did not. As a result, he will start 35th and spend the weekend without car chief Blake Harris, who was ejected. Crew chief Cole Pearn was visibly angry after the car failed for a third time, which followed what Truex said was an extra focus on getting through inspection. As it turned out, it was for his team. There were problems on one attempt with the body and problems with the rear-wheel alignment on another attempt. 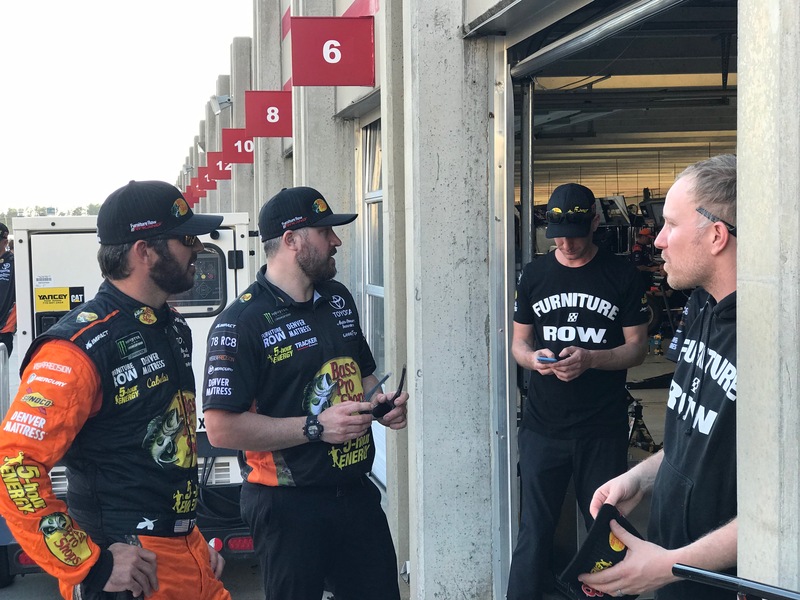 Furniture Row Racing president Joe Garone said the team was frustrated and the mood was “volatile” after the third failed attempt. NASCAR disputed the suggestion its new equipment was inconsistent. In fact, NASCAR senior vice president of competition Scott Miller said most of the comments he got from teams on Friday were the opposite. “Of course they’re going to say that,” Miller said of Furniture Row. “… All I can say is we feel like we did our job. The tighter limits could have made for far more headaches. Instead, the day was mostly smooth with the exception of the 78 team not getting through. “I certainly would have guessed there would have been a lot more (than Truex), that they wouldn’t have been the only ones,” Kyle Busch said. Chase Elliott’s car went through NASCAR’s laser inspection platform for a third time with just minutes remaining in the first round of qualifying. He was so sure his car had passed, Elliott immediately put on his HANS device and helmet and prepared to get in the car. But as his team started backing up the car toward the garage instead of pushing it toward pit road, Elliott realized he wasn’t going to get to qualify on Friday. He slowly unbuckled his helmet and followed the car toward his team’s garage stall. Elliott, 26 points below the cutoff line with two races to go, will now start 34th Sunday at Texas Motor Speedway. Elliott was puzzled as to why teams seem to struggle with inspection at Texas. His No. 24 was one of seven cars that did not make a lap — Matt Kenseth and Joey Logano were other notables — and Elliott also had to start from the back in the spring race. The 24 team, knowing how important qualifying was, apparently took a big swing at fixing the area in question after its first failed inspection attempt. Team members, including crew chief Alan Gustafson, appeared surprised and frustrated when it did not pass on the second attempt. “You’re kidding me,” Gustafson said. And when the car came through a third time, the team seemed absolutely certain it would get Elliott on the track with a minute or so remaining in qualifying. Instead, the car didn’t pass yet again. Some of you are putting me in a really uncomfortable position again: Having to defend NASCAR. It’s more natural for me to torch NASCAR for making a bad call instead of vouching for The Man, but damn — this silliness over blaming NASCAR for cars failing inspection makes no sense! The Nos. 42, 24, 18, 5, 77, 88, 37, 51 and 55 teams didn’t get through inspection in time to qualify at Texas. Do you know whose fault that is? The answer is the Nos. 42, 24, 18, 5, 77, 88, 37, 51 and 55 teams. Yes, NASCAR changed the rules this season, but they’ve been the same all year. If a team fails one of the four inspection stations, they have to go through each one again (whereas in the past, teams could pull out of line, fix what was wrong on the car and jump back in line for that one station). One reason is NASCAR wanted to cut down on all the inspection games. Officials are pushing teams to bring legal cars that pass tech on the first try — or else face the consequences. That brings us to Friday. Like every week, each team had three hours to get through inspection before qualifying, and they all had the chance to go through the stations at least once before the clock really started ticking on their chances of making a lap. And you know what? A bunch of them didn’t make it. In all likelihood, they were testing the limits (if they don’t, they’d be giving up a competitive advantage to those who do) and just went a little too far. They ran out of time and didn’t make a lap. Hey, that’s fine; I don’t have a problem with teams trying everything they can. They take a risk when doing so, but that’s up to them. But for crying out loud, don’t then get mad at NASCAR for your favorite driver failing inspection! Seriously, come on. NASCAR is trying to cut down on all the little tricks teams are doing to bend the rules, and we’re going to act like that’s a bad thing? Admittedly, I’m a stickler for rules. Those who follow the rules shouldn’t be at a disadvantage to those who don’t, just like those who bend the rules shouldn’t expect sympathy if they get caught. Kevin Harvick said everyone in the garage was supportive of a tighter inspection as long as some rule-bending doesn’t start slipping through the cracks.